This CBC station is "always" heard, but I wanted to have a local broadcast to report (and indeed the CBC v/s requires it). 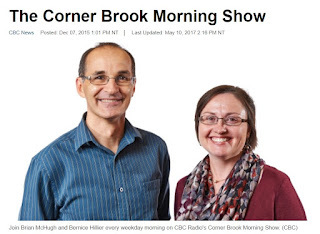 I got a nice recording of the Corner Brook Morning Show with audio from Bernice Hiller on January 18, and a friendly conformation today. 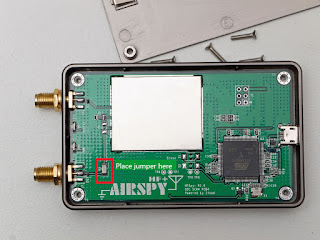 Almost four weeks into my ownership of the Airspy HF+, I think it's time to give my impressions from a MW DX-er's point of view. More here. There was a thread in the Airspy groups.io reflector in early January concerning sensitivity in the LF (and especially VLF) part of the spectrum. There were also intermodulation products on the LF band. I didn't really pay much attention to it. It turned out however that the solutions (a firmware update and a hardware modification) had significant impact on the receiver's performance in general. I had noted that sensitivity appeared to roll off much higher up than in the LF band, and Roelof Bakker kindly measured the 1000 kHz sensitivity and found -95 dBm (AM, 6 kHz, 30% modulation, 400 Hz tone). Which is good, but not outstanding. Roelof also confirmed that sensitivity was rolling off. The solution to the LF problem was a simple "bypass operation" as illustrated below. It not only solved LF sensitivity, but sensitivity in general. Roelof noted an improvement to -110 dBm, which is truly outstanding in the SDR world. Together with a firmware update this seems to not have compromised performance in any way, probably the contrary as it seems that the intermod problems are gone. I did the firmware update and R3 bypass on Saturday in less than half an hour. The improved sensitivity is indeed notable in my setup when noise levels and signal levels are low. I'm mostly using HDSDR with the HF+ now, because it's easy on remote connections and to set up recordings. Works well with SDR Console V3 and SDR# too. More to come. HDSDR is a favourite SDR software for me when I use other SDRs than Perseus. It's light on system resources, and has a huge selection of keyboard shortcuts which makes it very quick and efficient. 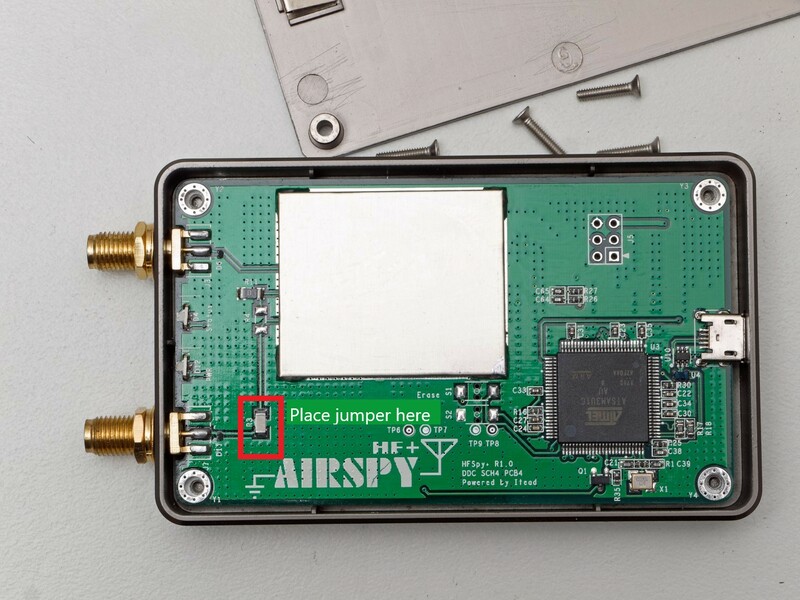 Andrea Montefusco, IW0HDV has made an ExtIO for the Airspy HF+, the latest version came yesterday. Below is how the Airspy HF+ works via remote connection on a morning with fair conditions towards North America. CKGA with its VOCM programming is common at our Smøla island location, but to get a QSL, one must report! I had hoped to hear their local programs which start at 6.00 am NST or 0930 UTC, but the Greenland station is totally dominant at that time. A video report, required because otherwise I couldn't authenticate which VOCM station I was listening to, was confirmed today. Newfoundland #15. "Daytime conditions", i.e. skywave propagation from stations still in North America's sunlit zones, have been fair the past several days. One of the stations heard by many DX-ers in this region is WWBC, and with the Boston station silent it's been even easier to hear. My reception on Jan 12 was 45 minutes before their sunset. The owner John Harper was known to me before, because another of his stations, then-WMEL 1300 was heard and confirmed a few years ago. Another email overnight confirmed WWBC. Somewhat confusing perhaps that his network is profiled as "The Talk To Me Station WMEL", because the WMEL call letter no longer exists on MW. I heard KUFO almost a year ago but have had little luck with the QSL part. Until today, when one of their engineers sent me a full-data QSL letter in a Word file! I rarely chase Latin American stations, my total QSL count is embarrasingly low. When tuning around late on the 17 I caught a nice ID from Radio Nueva Esparta, and sent off a Facebook report. I received a friendly response within minutes. We exchanged a few messages after that. Smøla island is an excellent spot for logging eastern North American stations, and for a few days signals propagated into the EST daytime zones, both in the afternoon and the morning. Excellent signal from WCCM one evening, and a quick response to my report. The new, 700-metre beverage at 290 degrees performs admirably. After a few weeks of use in Kongsfjord and Smøla island, here are my impressions of this inexpensive, but quite able SDR. Every now and then, a frequency dominant fades and gives room for less common stations. 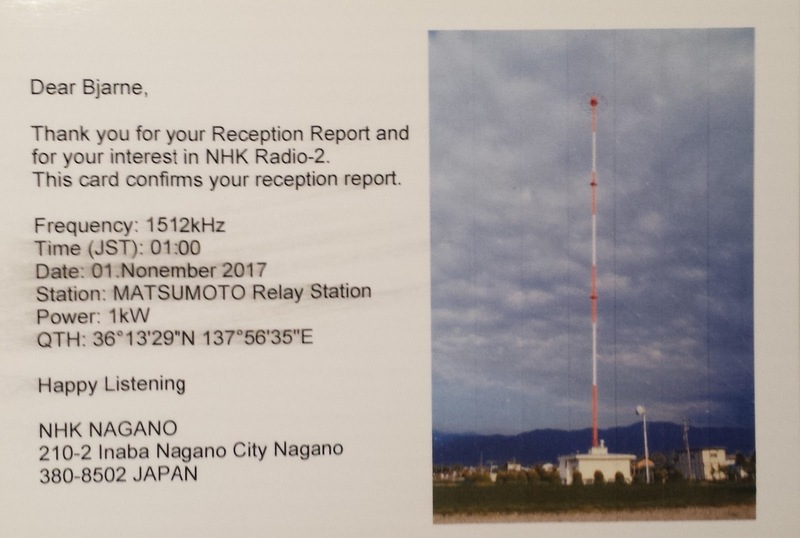 Like late October when the usual JOZB NHK-2 Matsuyama gave way to the 1-kW relay of NHK-2 Nagano in Matsumoto. A custom-made QSL, obviously printed on an inkjet printer, was received today. "This is CBC Radio One. 98.9 FM in Yellowknife" was the rather unexpected announcement on 1280 kHz one evening in November last year. CBQT Wrigley is one of CBC's low-power repeater stations, and the only one on 1280. An email from CBC North confirmed my reception, thanks to Ole Forr who first spotted it. The distance is 4975 km, so even 40 watts can travel great distances when propagation is right. Wrigley has around 130 inhabitants, and is the end point of the Mackenzie Highway. There is even an air strip at the east bank of the Mackenzie River. Canada MW verie #220. This relay of JOHC 1386 was heard with surprising clarity one day in late October, and I received a friendly letter today. Naze is a 1-kW relay, located on the island Amami Oshima, 350 km southwest of Kyushu island. MW verie #110 from Japan. I'm currently spending the weekend at an extremely stormy Smøla island together with OJ Sagdahl, Ole Forr and the host, LA2XPA Rolf Torvik. I have had the chance to compare the receivers mentioned before, and the results were not very surprising. Inexpensive SDRs may in some instances be a good alternative for the dedicated MW DX-er, but if the signal levels are high, the Perseus shows its might. That said, the HF+ did remarkably well. Here's the write-up. 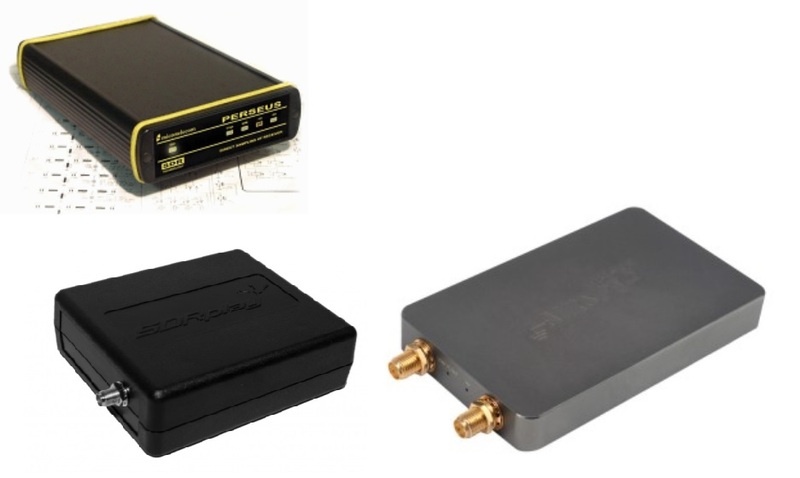 As mentioned in a previous post I also got hold of the new SDRPlay RSP1A just before Christmas, so two novel SDRs with rather different architecture were purchased the last month. Below are the two together, the HF+ to the right. The RSP1A, no monster size itself, brings perspective to the credit card sized HF+. There are no LEDs on the SDRPlay. The HF+ has a tiny orange LED for power, and a blue LED for running. - Test the SDRs against the Perseus as a reference SDR in a period with the highest signal levels. - Test the SDRs against the Perseus in a period with the lowest signal levels. Hopefully, I will be able to note any differences with regards to overloading, and the ability to separate weak signals next to very strong ones. I should also be able to note how they resolve very weak signals. The SDRs will be connected to an efficient beverage antenna, and being a MW DX-er, I will focus on MW and possibly a bit on SW. I won't tune above 30 MHz! Promise! 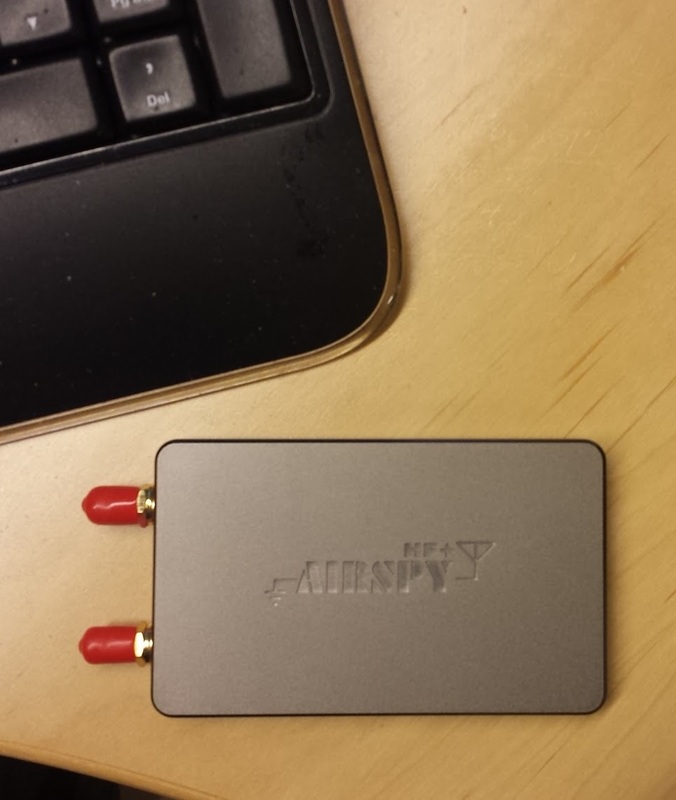 In the series "You Can Never Have Too Many Radios" the next chapter is Airspy HF+ which I picked up at the post office today. Its MW capacity will be tested the coming weekend. It's small, as you can see, but quite heavy. 90 x 55 x 12 mm excluding the antenna ports, and 187 grams. More to come. 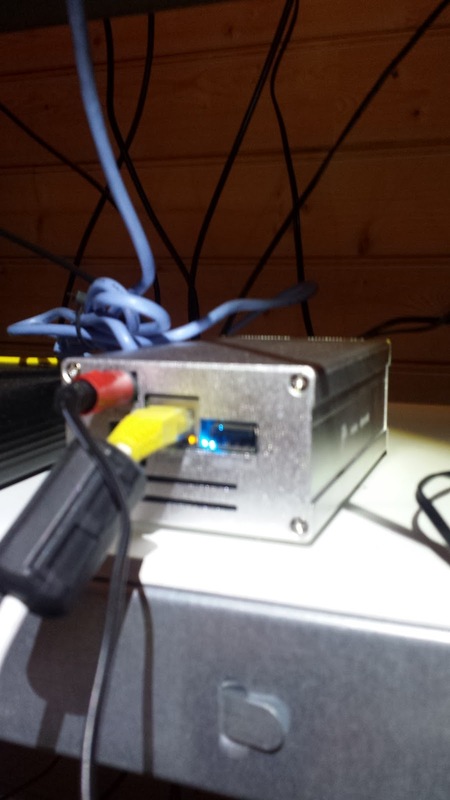 Despite wintery conditions, the KongSDR has been online practically every hour of December, thanks to excellent hardware and a broadband mobile connection without outages. In December, the manufacturer Seeed finally offered a metal enclosure for the KiwiSDR, which adds a little physical and RFI protection. Here it is, rather out of focus, standing next to one of my Perseus SDRs. The financial support for the KongSDR is still strong. I am thankful that many users find it useful and want to contribute to its existence. Happy New DX-Year!